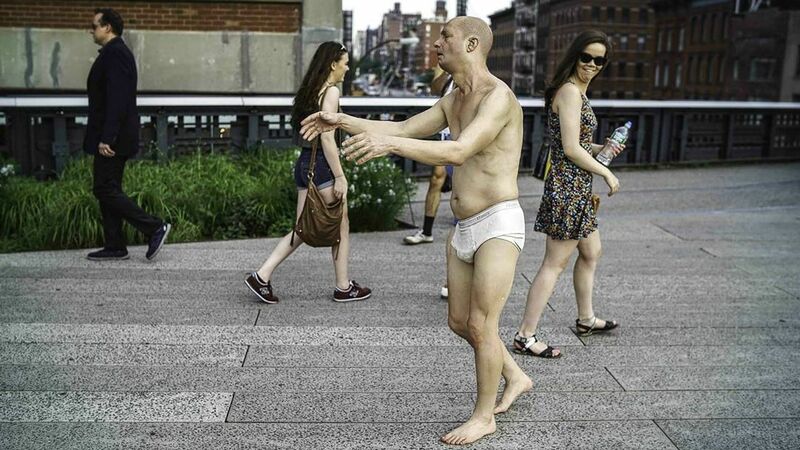 Featured on the High Line: Wandering, Sleepwalking Man or Sculpture? THE HIGH LINE, Manhattan (WABC) -- At a first look at the photograph above, what do you see? Is it a sleep deprived, nearly naked man roaming the streets of New York? Or is it a sculpture that is a featured piece of art at the High Line? Or, how about now, with a close up shot? If you have to glance at the photograph twice, you're not the only one. With thousands of photos on Instagram, nearly 13,000 search results on on Google, and hundreds of hits on Facebook and Twitter, the "sleepwalker" is grabbing some serious social media attention. People are talking about his life-like characteristics, and taking pictures with him. Created by artist Tony Matelli, this is the third "Sleepwalker" sculpture he has created. The first was created in 1998, which featured a male only in his underwear, and the second was created in 2009, which featured a female only in her underwear. The latest "Sleepwalker" sculpture, which is featured at the High Line, was created for Matelli's solo exhibition "New Gravity" at the Davis Museum at Wellesley College in Massachusetts. Displayed outside of the museum, the sculpture displayed an older looking, nearly six foot male only in his underwear. There was even a Facebook page made for him. The outpouring negative reactions from students caused some to compose a petition, where they explained their concerns and their desire to have the sculpture be moved. However, despite all of the commotion from Wellesley College, Matelli's sculpture is now a part of the High Line's newest art exhibition, "Wanderlust," which opened April 21. The "Sleepwalker" is a huge hit on social media, with people posing next to him in all sorts of different forms and poses. Containing works from all different kinds of artists, "Wanderlust" "is a group exhibition that explores the themes of walking, journeys, and pilgrimages." The "Sleepwalker" will be on display until March of 2017. There is also an Instagram contest to see who can post the most creative photo. Find out more information on the High Line's website. And for your enjoyment, here are some more reactions to the "Sleepwalker."